Treasure found on Captree Island! 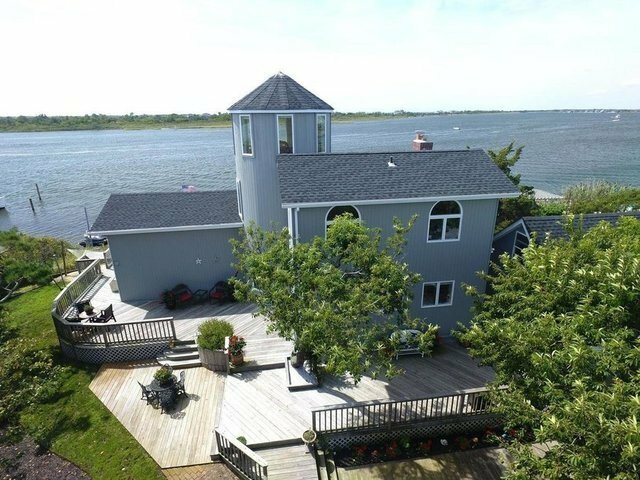 This Renovated contemporary 4 bedroom 2.5 bath waterfront home has a perfect balance of clean lines modern amenities and nautical details such as 18 ft ceiling heights drift wood stained exposed beams and shiplap ceilings. The open concept floorplan is perfectly balanced with bright white interiors soft comfortable furniture and a wall of windows embracing its waterfront setting to live and enjoy life from both its indoor and outdoor dining spaces. The kitchen is appointed with stainless steel appliances custom cabinetry and large granite island perfect for entertaining. The Master bedroom is luxurious with its cathedral ceilings outdoor spa and en suite master bath with beautiful Carrara marble throughout and custom gray cabinetry. This unique home with all its open spaces and large bedrooms also has various areas to privately reside such as a 360 degree pilot house walkout basement with fitness area and bar 2 car garage with lofted second level and wrap around deck private beach with 100ft of waterfrontage and private 40 ft. pier to park your boat and wave runners. Captree Island is located just 3 short miles to Robert Moses State Park Fire Island Babylon trains and shopping. The islands is an anglers paradise with its many protected parks duck marshes and beautiful natural settings .